The Renix throttle bodies have a strange and failure prone connector on the side where the MAP supply originates and then runs up to the MAP sensor located on the firewall. This hose/pipe assembly is no longer available for purchase. The real kicker here is how critical this line is in supplying the correct vacuum signal to the MAP, the most relied upon sensor for the ECU to read regarding air/fuel ratio. Any cracks, melted spots, or loose rubber connectors can cause major starting and driveability issues. There’s a simple fix though. All that’s required is a 1/8” NPT tap, a new throttle body gasket ( Napa FPG 60742 ), a vacuum fitting (Napa 05703-B102), two vacuum elbows (Napa2-670), and a length of new plastic piping (Napa 2-672). Remove the throttle body and take it to the workbench. Using an oiled tap along with a driver, carefully thread the lower of the 2 holes of the throttle body where the old fitting was plugged in. Don’t go too deep. These are pipe threads. Flush the hole with carb cleaner and inspect for any left over cuttings. This is an excellent time to do a complete throttle body and IAC cleaning. See Tip 11. Take the vacuum fitting (05703-B102 ) and apply a LITTLE bit of thread sealer on the threads only. I prefer Permatex #2 but almost anything is fine. Carefully screw the fitting in until snug. Install one of the vacuum elbows on the MAP sensor so it points toward the throttle body, and the other vacuum elbow on your new throttle body fitting so it points up to the MAP sensor. Cut a length of the new plastic tubing (approximately 13 inches) to fit between the vacuum elbows and install it making sure there is enough slack for some engine movement. Route it according to the photo. We don’t want any rubbing or chafing with engine movement. Not a bad idea to use some contact cement or Gasga-Cinch sparingly on the tubing to elbow connectors. What do you do with the top hole in the throttle body? Nothing. It doesn’t go all the way through like the lower one does. Kind of a weird deal to hold the original vacuum tube in there. Brilliant article, I recently purchased a rough running 90 XJ Wagoneer in the UK. One of the issues was the missing fitting on the TB, I will be doing this upgrade. Lots of good info on here, much appreciated that you are sharing. Be sure to do Tips 1,3,4, and 5 first chance you get. I used the factory rubber fittings and replaced it with 3/16 brake line. Would that allow too much air and throw off how sensor? Not at all. You’re good to go. Does the MAP sensor have to be connected to the lower hole in the throttle body? My MAP sensor is connected to a forward intake manifold vacuum fitting for some reason. Would the location of where mine is change the way things work? Not an issue at all, Joe. 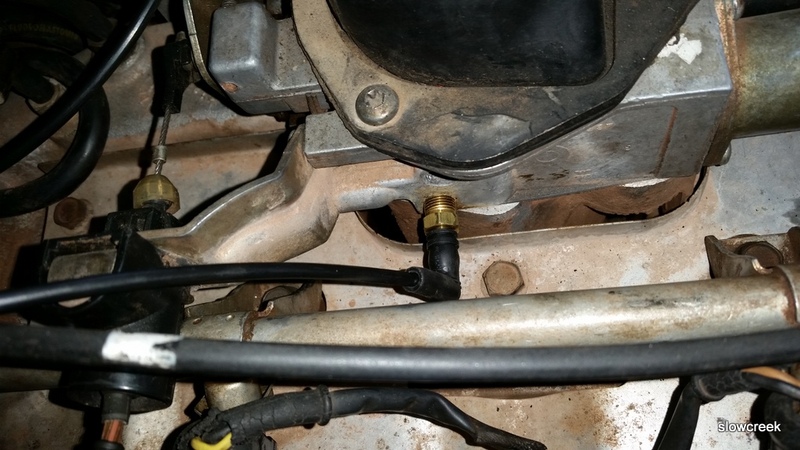 As long as the hole in the throttle body where the hose originally connected is plugged. I’ve done numerous ones that way. You either have the vacuum source for the MAP at the throttle body or at the intake manifold. 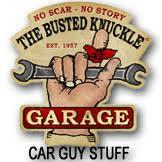 If using the intake manifold, the throttle body hole must be plugged. Sounds great. The lower throttle body hole has a hard plastic hose going to the rear part of the intake manifold near the IAT sensor. I need to see a photo of your vacuum routing. How do I add pictures on here? I took pictures today, but not sure how to send them on here. The lower throttle body hole shouldn’t go back to the intake manifold? I will take pictures tomorrow if I haven’t burnt the POS to the ground. Can i use a NPT connector (1/8 thread) without factory rubber fittings? Only connected by a hose with the same size of the map terminal. Thanks. Excellent website. I imagine you could, but using only flexible hose can lead to issues if the hose splits or collapses. my 90 xj just recently started idling rough and sputtering when im on the throttle. I noticed that the line going in the throttle body is cracked at the tip but is still in the rubber boot. I tried going on napas website but cannot order the hose or 90* fittings online. what are the sizes and do you know any suitable substitutes? thank you so much for your time. I don’t want to give up on the battle wagon just yet. 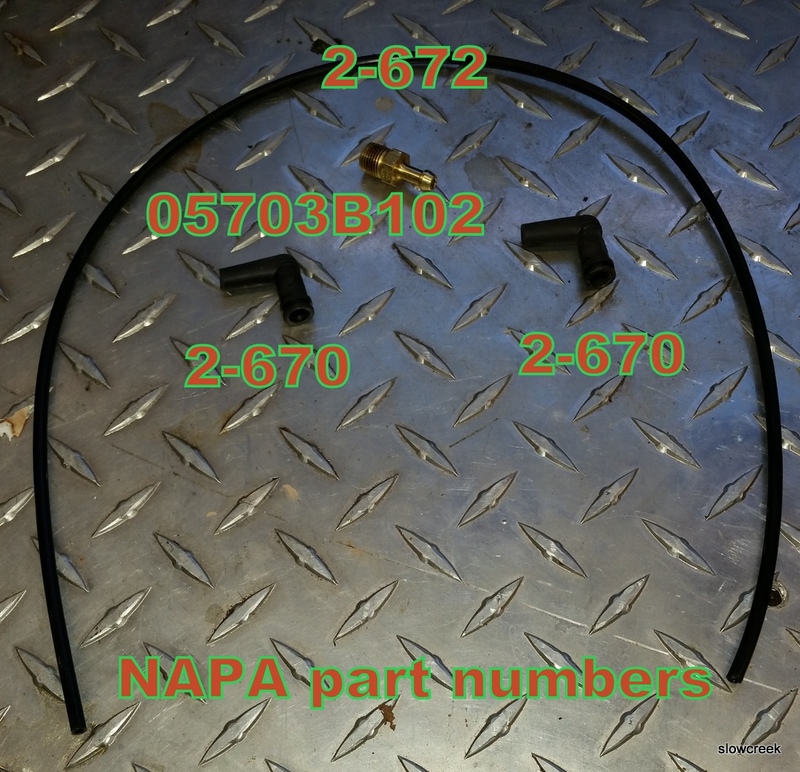 Napa’s website is showing the Elbow and Tubing part numbers as Echlin Fuel System: CRB 2670 & CRB 2672. Are these still the same parts? Thanks for putting this website together, it’s amazing. Nevermind, I’m a tool. Just noticed they are the same, just without the dashes. Google wasn’t redirecting me to Napa’s website searching for “2-670” so it threw me off. LOL. Glad you got it. Finally getting around to this step. Continuing to work through the list. Running rough after shop replaced engine. Good thing to do regardless.